The third round of the USC NSW Series also doubles as a tribute to two guys who have probably been revered for a combination of innovative and "Old School" over the last thirty years. Peter and Richard Craft are renowned for a combination of being mechanics, car builders, car owners, crew chiefs, drivers and Sprintcar club and council administrators since moving to 'the big smoke' from their native Dunedoo - a tiny town of 800 inhabitants located 360km north west of Sydney. Their business "Craft Differentials" located a short drive from Valvoline Raceway has housed some of the sport's biggest names and their respective cars over the years, including Peter Craft's own many #86 entries that he raced. 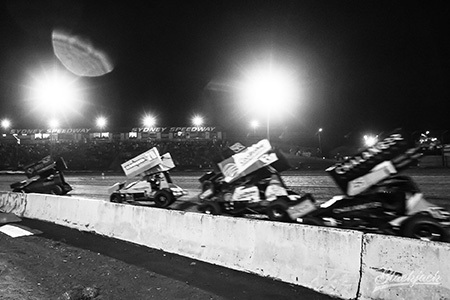 This Saturday night, almost fittingly, is known as "Old School" night where the USC will replace qualifying with an extra heat race per driver like many nights of competition prior to the USC car counts at Valvoline Raceway and as it was known "Parramatta City Raceway" when first created. A fierce entry list of drivers has showed up to race for the Crafts including no less than three Victorians in the form of USC opening night victor Jamie Veal, Chariots of Thunder NT Series champion James McFadden who makes his 2018/2019 VR debut along with Winchelsea hard charger Ryan Davis. Darwin father and son team Ben and Benny (Jr) Atkinson again take the geography award with their massive travel logistic commitment each event in Sydney from the Northern Territory. The Parramatta Posse is, as always, joined by QLD based Robbie Farr in the ECP #7 and NT born Gold Coast bred Danny Reidy in the #NQ5. The NSW field is a broad cross section of rookies, newcomers, seasoned veterans, siblings, father-son combinations, father-sons combinations and new faces making the transition over from a different category. In addition to the Ultimate Sprintcar Championship Saturday night will be the "Roof off rumble" for Late Model Sedans where the thunderous wedge cars take off the 'lids' and get some moonlight into the cockpit. Tributing the 47th anniversary of the passing of American legend Bob "Two Gun" Tattersall the Speedcar will contest the "Two Gun 25-lapper" with a stellar field attracted.